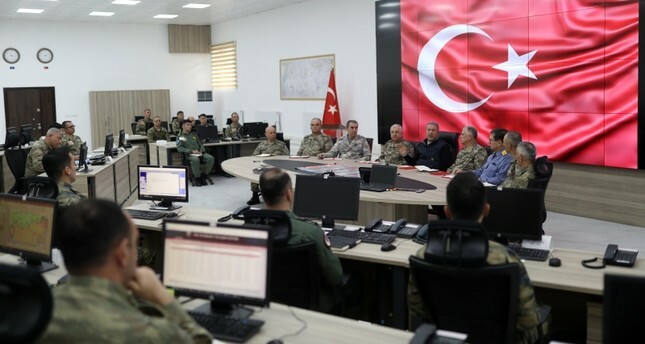 Turkey's defense minister and chief of general staff on Saturday inaugurated a center in southeastern Şanlıurfa province that would manage possible military operation against terrorists east of the Euphrates River in Syria. Hulusi Akar and Gen. Yaşar Güler also inspected Turkey's forces deployed near the Syrian border in Şanlıurfa. Speaking at the inauguration ceremony, Akar said Turkey is in pursuit of terrorists with an air operation launched early Saturday in northern Iraq. In another operation three days ago, Akar noted, PKK ringleaders suffered "heavily." "This will continue. No one should have doubts about that," he added. Akar said that Turkey's plans and preparations for a possible operation east of the Euphrates in Syria are completed.